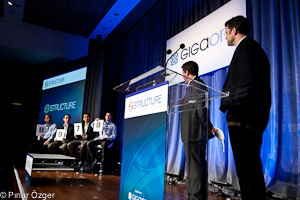 Our LaunchPad finalists at Structure reflected the cloud’s growth over the past few years. The few that provide core cloud services are taking innovative approaches, and many of the other companies provide services that go well beyond core functionality. The judges — Mayfield Fund’s Navin Chaddha, Norwest Venture Partners’ Matthew Howard, Silicon Valley Bank’s John Lee and Sequoia Capital’s Luis Robles — and the audience both agreed on the winner: DotCloud. Acunu CEO Tim Moreton demonstrated how his company helps enterprises achieve “consistently and predictably higher performance” from their commodity hardware systems. Acunu’s technology combines storage stack pipeline into a single platform, promising less latency and more range read throughput. Beyondcore CEO Arijit Sengupta described how his San Mateo-based company helps clients utilize the cloud as much as possible by ensuring the privacy and security of their sensitive data. Beyondcore’s SplitSecure technology splits–and later recombines — private information from the more general data that can be stored in the cloud. CloudFloor CTO Imad Mouline demonstrated the company’s cloud management and optimization service. The Waltham, Massachusetts-based company has built its service to help both IT and business people get control and visibility over their cloud operations. DotCloud CEO Solomon Hyes described his company’s platform-as-a-service offering, that allows developers to run any major application or database stack in the cloud, regardless of the programming language or database it utilizes. The San Francisco-based startup received both the judge’s choice and audience choice awards for its Structure Launchpad presentation. GenieDB founder Dr. Jack Kreindler described how his company aims to solve large-scale distributed data problems with its geodiverse datafabric. The Orange County, Calif.-based startup has developed a datafabric that combines SQL and NoSQL for platform-as-a-service providers and cloud builders. PHP Fog founder and CEO Lucas Carlson talked about his Portland, Oregon-based company’s platform-as-a-service technology aimed at PHP developers. PHP Fog hopes to drastically reduce the time it takes for developers to build an application, potentially helping them save time and money upfront and system and scaling costs over time. Real-Status CEO Royce Murphy demonstrates his company’s modeling and visualization software product HyperGlance. The Cambridge, UK-based company purportedly helps companies visualize their experience in moving and hosting their data in the cloud. vCider CEO Chris Marino shows off his company’s on-demand distributed virtual switch product for the cloud. vCider works as a self-service overlay on top of existing networking structures. Zerto CEO Ziv Kedem launches the company out of stealth mode, announcing its technology for ensuring disaster recovery in the cloud. Zerto aims to help companies feel more comfortable with moving critical applications to the cloud by ensuring business continuity and disaster recovery by replicating data in a virtualized, hyper-visor layer.